January is almost gone! so we are now celebrating our first Sale of 2019 . 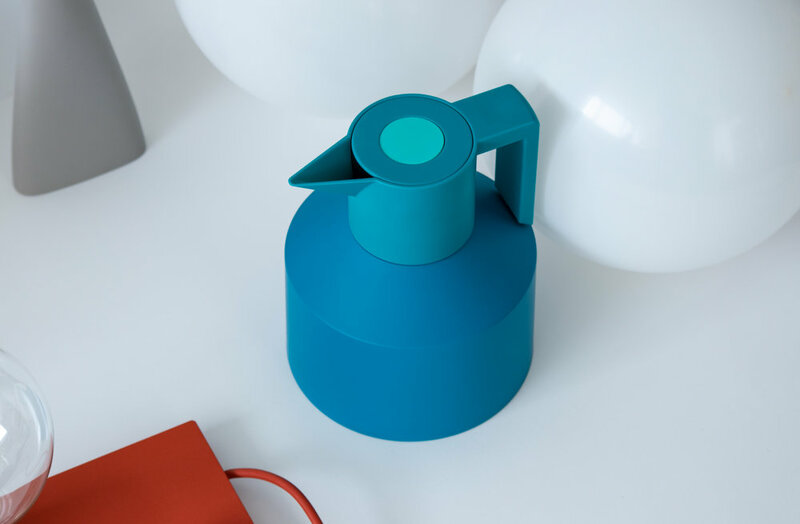 In a simple and playful set these are some of our most colourful products. Hope you like it ! 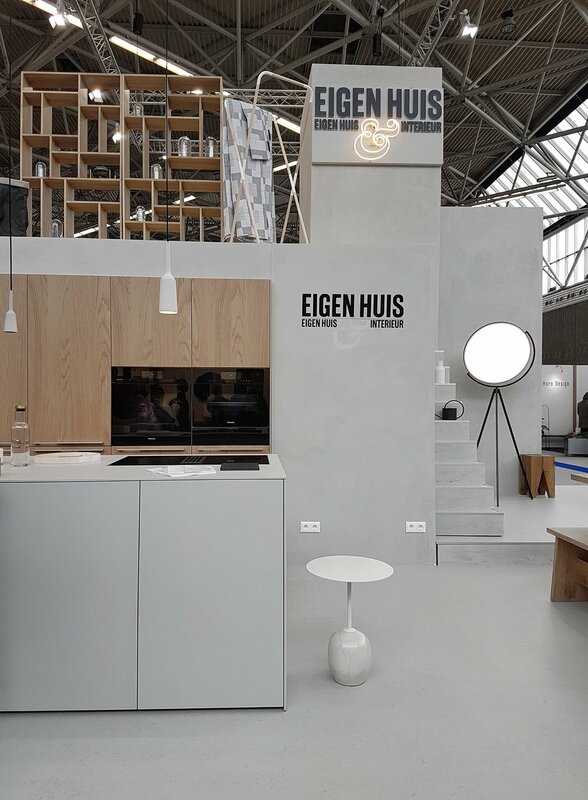 Shop our sales online or in Deense Kroon, Eindhoven and get up to 50% OFF you favourite products! Its official, 2019 is here! And the celebration of the new year is a focus we wanted to take. not what happens for the next year, not reminisce on what happened the last but the celebration for celebration’s sake! party to be happy and happy to party! 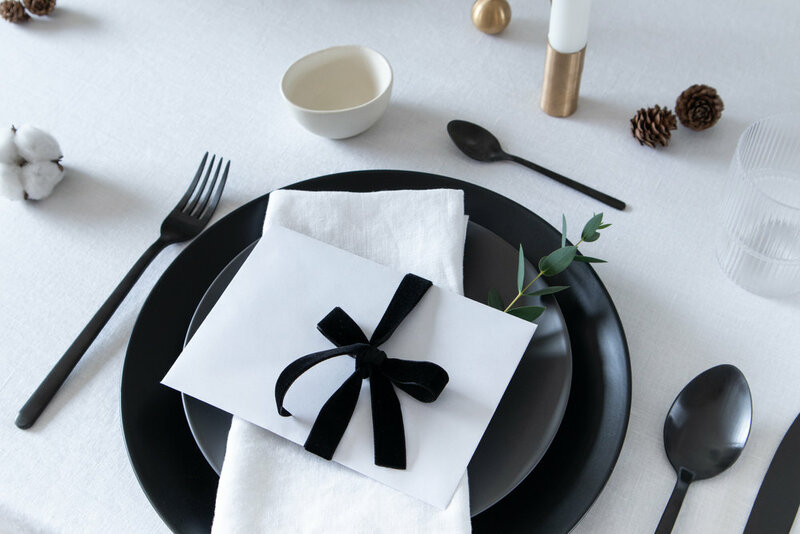 And as we celebrate the end of the year hoping you are taking the time to celebrate on your side, we question the colours, tones and geometries that remind us of being festive. 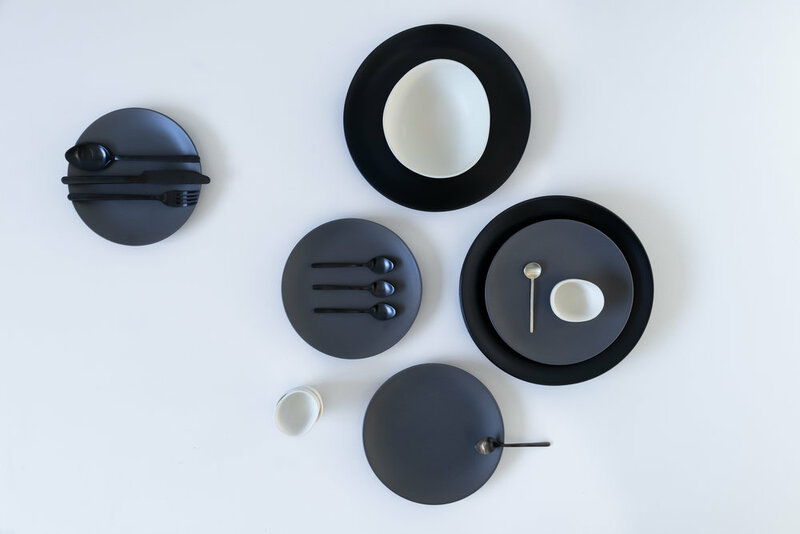 Can simple objects provoke the party feeling? Our family Christmas dinner is a tradition we started when we came to Holland. Since we are living so far from our friends and relatives it is us 4 and only us, but like every year, we try to make it special. Colours that remind us of the holidays without having to turn to the all time traditional red and green. 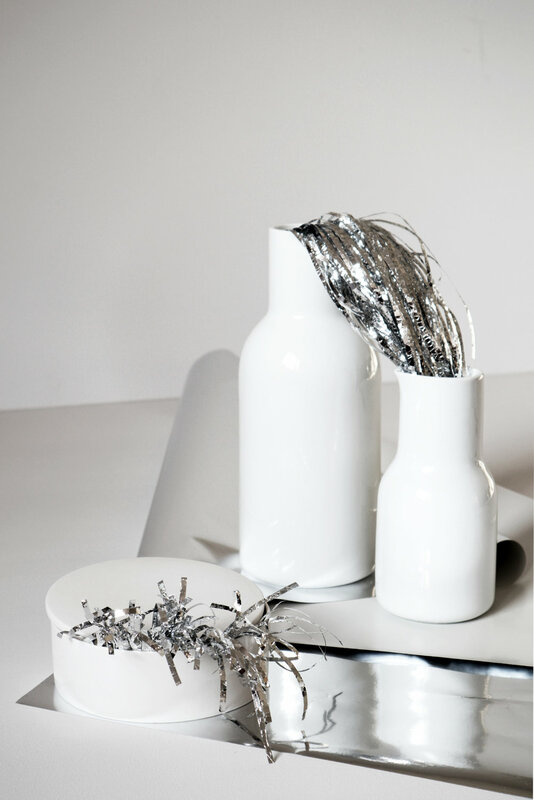 A small shoot we did for the dinnerware we used for our Chritmas table setting. 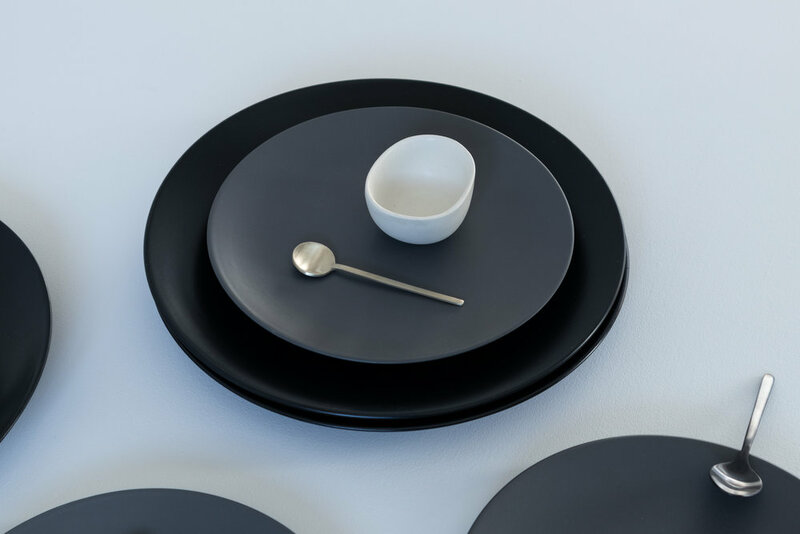 Golden spoons are from Ferm Living everything else is courtesy of to H&M. 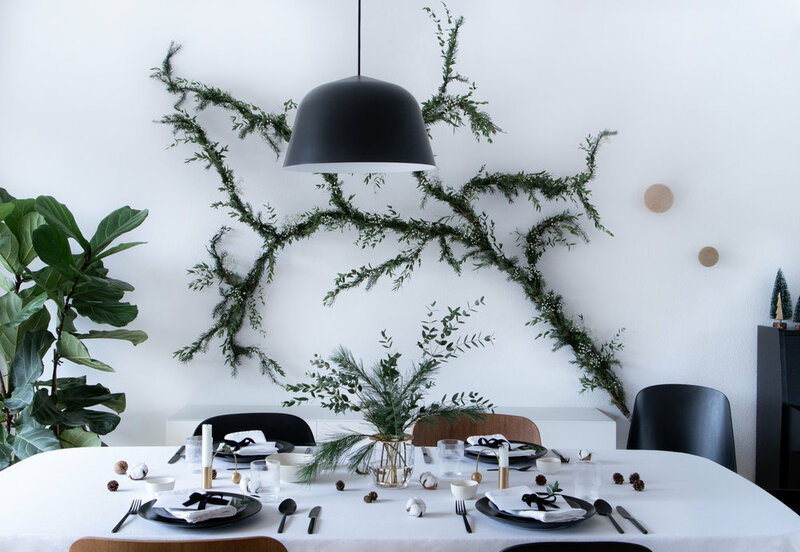 This time, in collaboration with agency Kolk & Kolk, we created a small setting with beautiful items from the new Ferm Living collection. 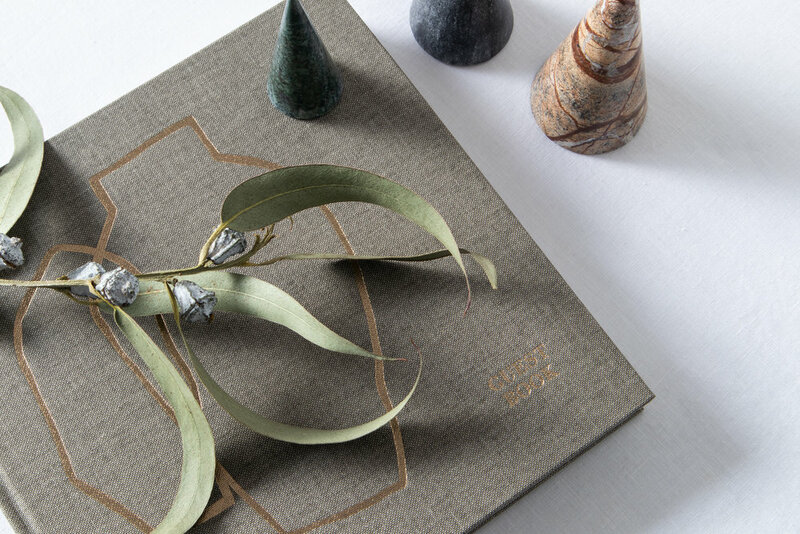 A beautiful book, where all your guests can write on, becomes a center point in this season of friendly gatherings and family get togethers. 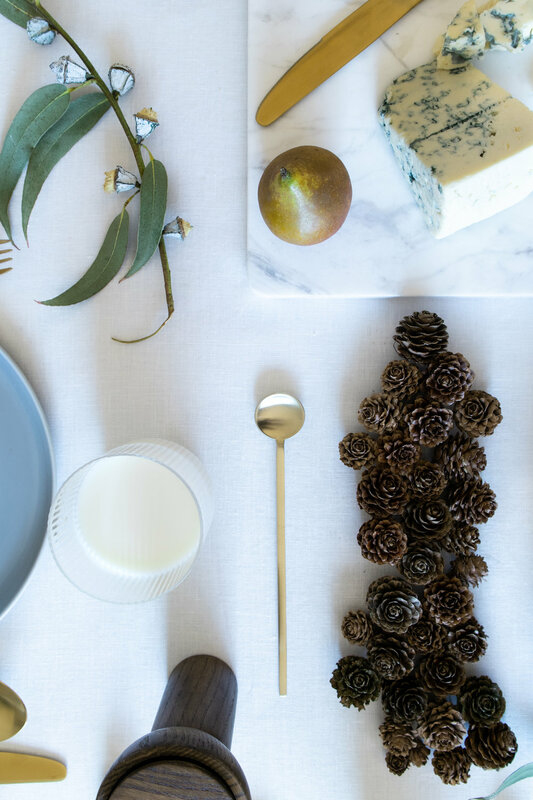 The simple minimalistic Marble cones resembling Christmas trees, reminds us of these cold winter days that we are happy to share with our loved ones. A simple setting like this one looks great in your entry, while giving a kind welcome to you house guests. Candle holders come in many shapes and sizes, but this version of advent crown strips all the extra, leaving only the essential to stand out and shine. Holiday season is on and it definitely means that gift and wrapping season is coming as well ! For our new window display design at Deense Kroon, our inspiration came from the wrapping ritual that goes along with the Christmas period. 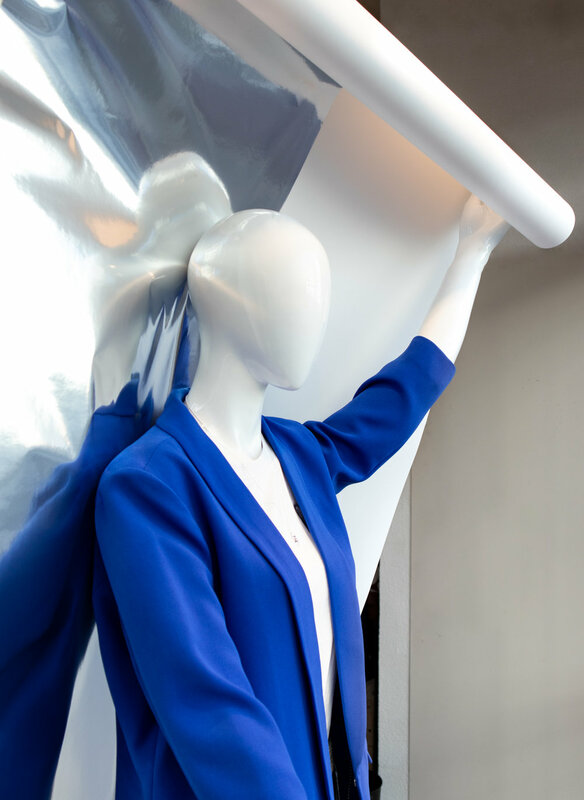 In a very simple and essential installation, the mannequins are wrapping themselves in paper rolls, getting ready for the gift season ! Are the key words of this playful display. 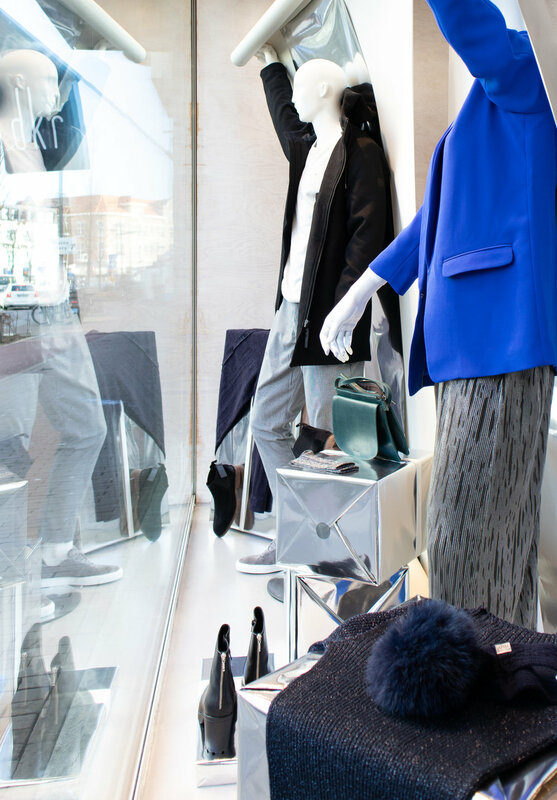 The minimal color scheme of the display gives freedom to the shop to arrange new clothing styles and combinations along the season. Are you excited about gift hunting ? 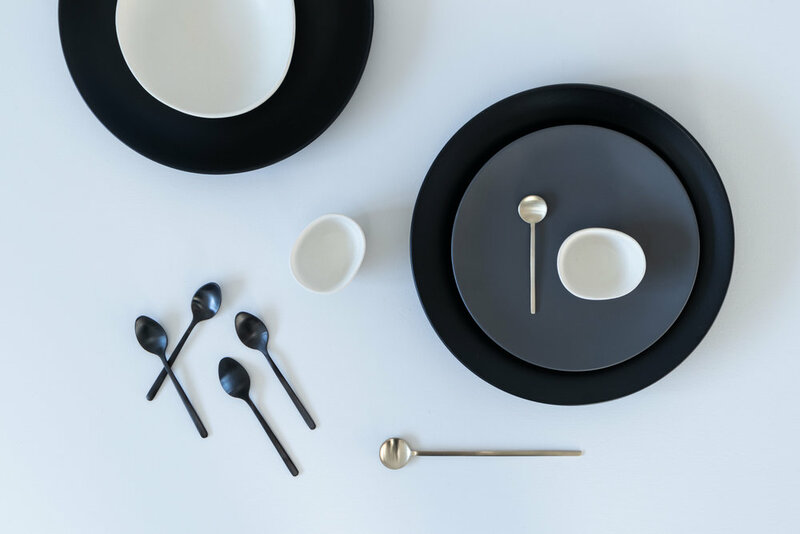 Come at Deense Kroon for a selection of ideas for interiors and fashion, and find even more on our webshop ! In Deense Kroon, you can find a beautiful finely curated selection of Scandinavian fashion both for Him and Her. If you are in that shopping mood, check out their sites following the links in the images below! Or drop by the shop if you are around Eindhoven, you will get a wonderful mix of fashion / home that will fill your christmas tree this year! Want to collaborate? Contact us, we love to hear from you! Comments about this or other projects? let us know through the comment section. Exciting! 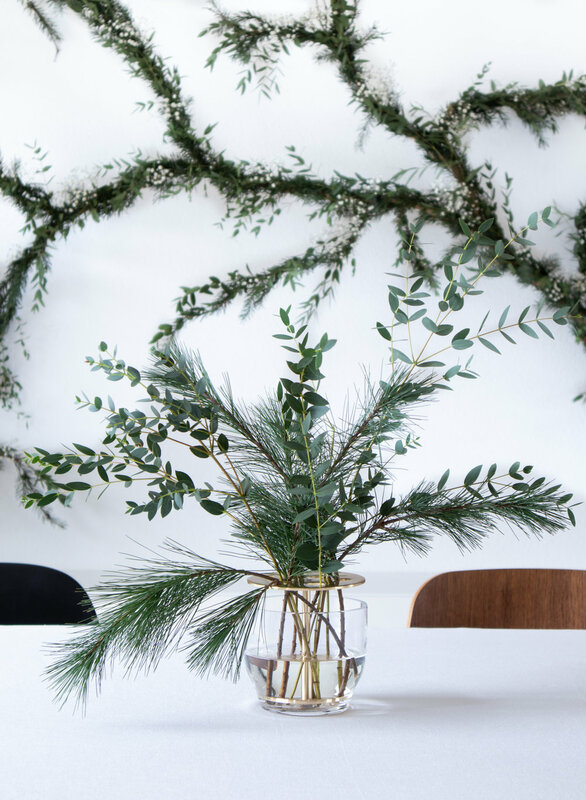 holiday season is ON and you are setting up your house for party time, well so are we ! To promote our favourite holiday decorations, our new creative campaign was about playing with mirrors and reflections to create surprising yet simple and elegant visuals, just as we want our holidays this year! 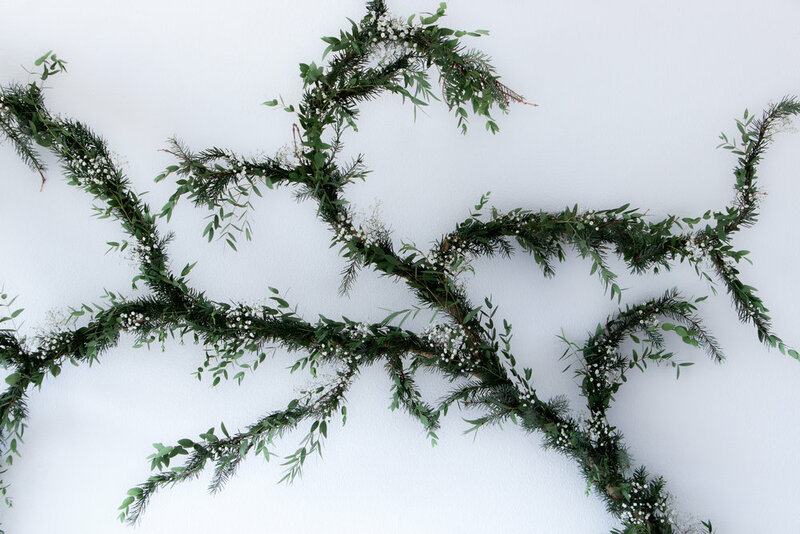 Shop online all our holiday decorations, and get ready for the best season of the year! Last week has been very inspiring when working on our new Black Friday campaign, and we are so excited to finally share it with you ! Geometrical patterns extended from the actual object. Since Black Friday goes along with light prices, the concept of our creative campaign focused on the surprising effects of light. We played with spotlights to enhance the contour and profile of our products in creating majestic and impressive shadows, for a very graphical outcome. 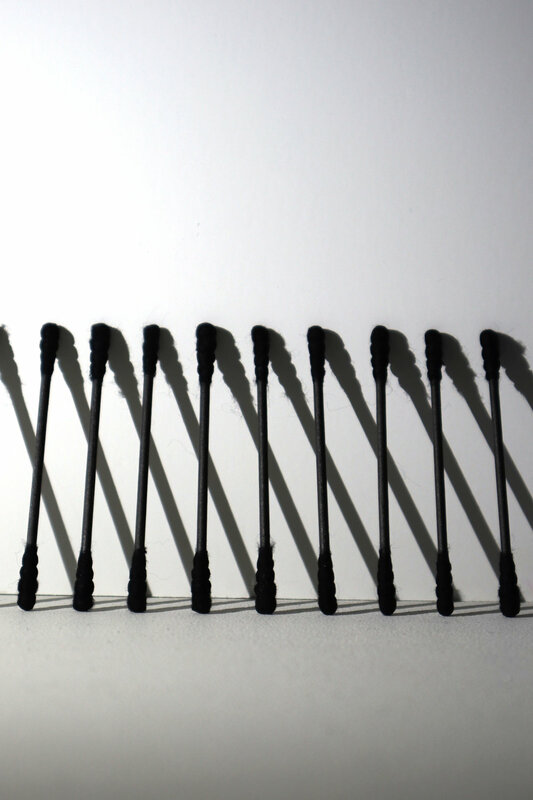 The shadows drawn on our set became an extension of their product, and really felt alive when the lights were moving. If you are curious about the process behind it, check our instagram stories @crioll.design ! 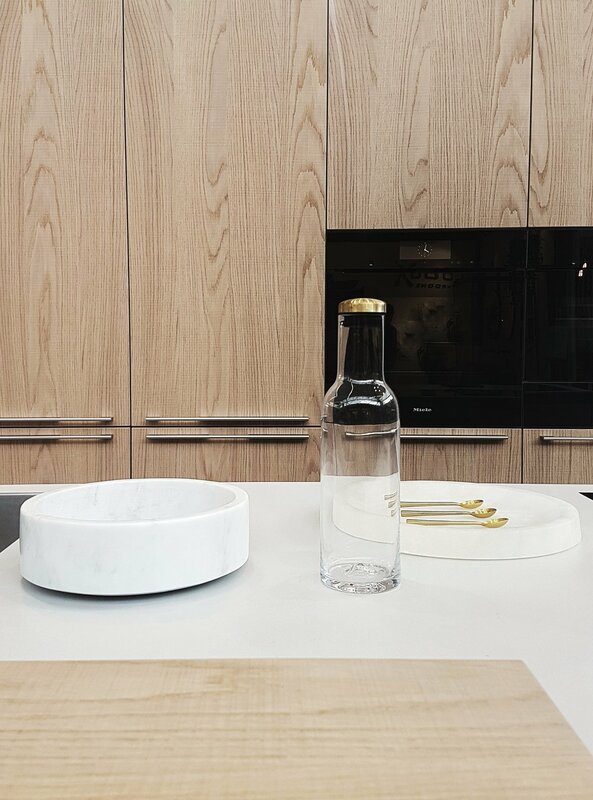 Working with the Ripple Champagne Glasses of Ferm Living was such a highlight ! We were mesmerized by the beautiful and define patterns it was creating when lit up… such a magical and surprising moment ! 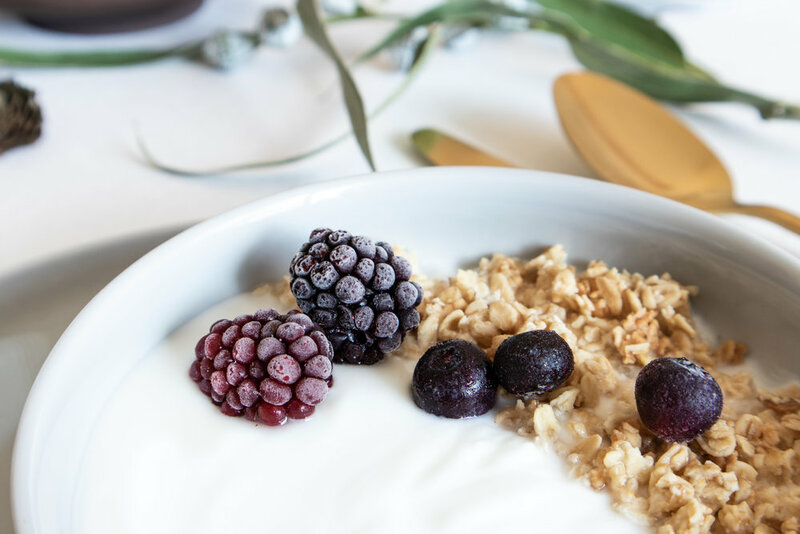 They are definitely a must have in your house ! Now, be assured, we are more than ready for Black Friday and lucky you, on Friday 23rd, all our products are 20% off on our webshop ! Don’t miss out on this chance ! We hope you enjoy our visuals as much as we enjoyed creating them ! Want to work with us? We would love to hear from you ! This Year, Daphna Laurens made several apparitions throughout the city during DDW. 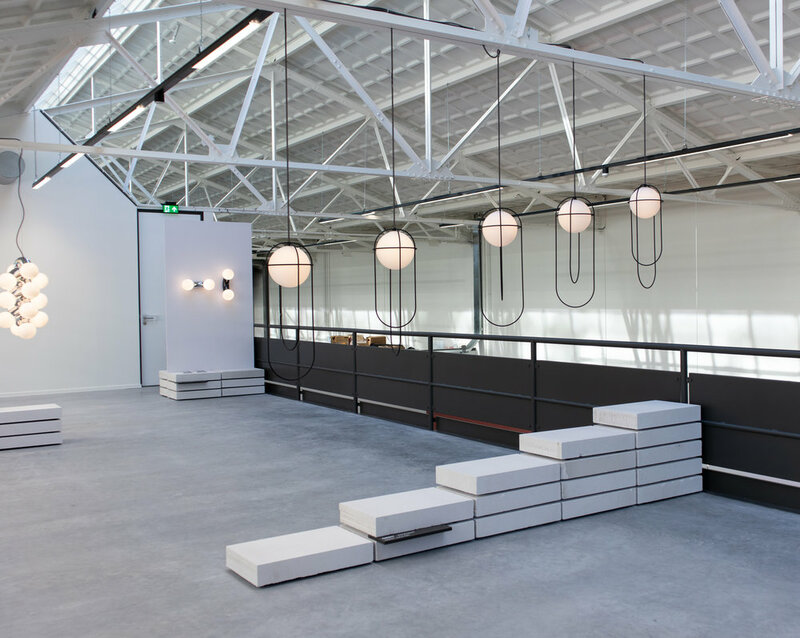 One of our favourites was their Colfront installation in the newly renovated building of Strijp T in Eindhoven. 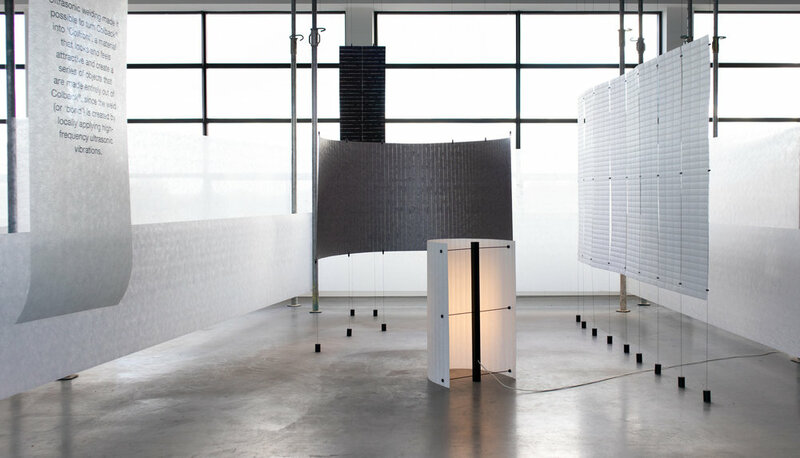 By experimenting with a very well known industrial product - Colback - a textile used for millions of applications that you never see, meaning it’s always applied “under the hood”, Daphna Laurens have created a set of room dividers and curtains that where put together using several layers of the material and combined using ultrasonic welding! The terms sound super technical but for us it was a beautiful, extremely simple set up that proved once again that by experimenting with known materials in a different way, we can create new textures that can be used in many different ways. Congratulations guys! the installation looked beautiful. Its always exciting to catch you for DDW. Os & Oss is a design studio based here in Eindhoven and this year for DDW they where able to showcase their best work created since they began more than 7 years ago in a beautiful location inside the newly renovated building in Strijp T.
Body of work encompasses their best projects developed in the last 7 years, since the studios conception in 2011. 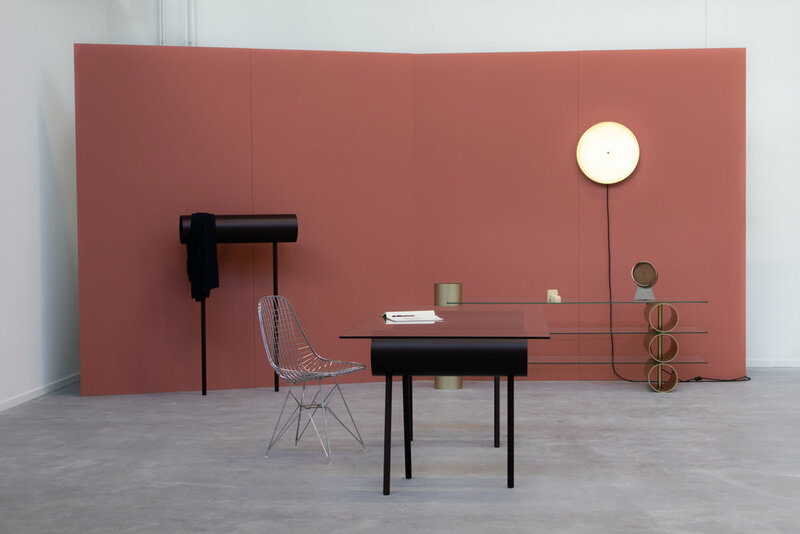 Their objects include lamps, a desk, chairs, mirrors, coffee tables and a very humorous lounge chair that was created for the danish label Please Wait To Be Seated. 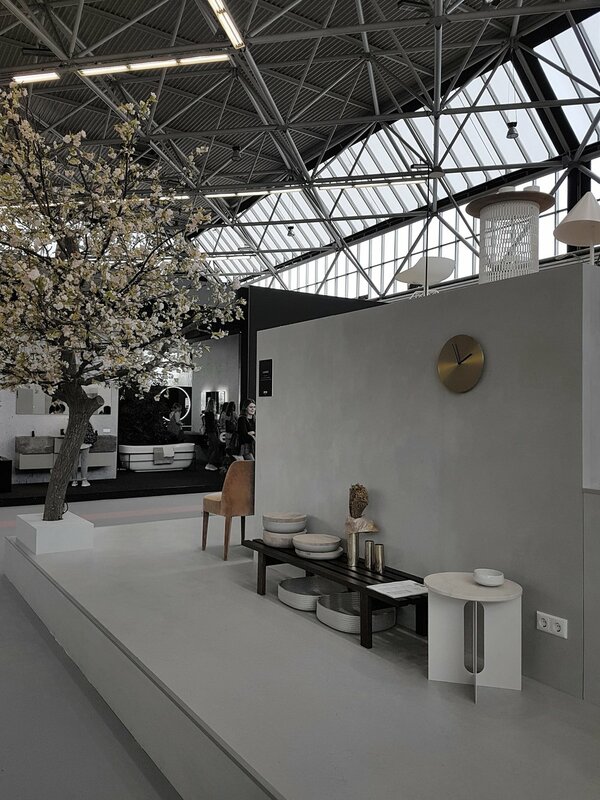 A showcase of surfaces, seating and lighting that together show a broad application of the concept, to showcase the possibilities as well as the visual aesthetic. A technique of depicting volumes and spatial relationships on a flat surface can be referenced to the viewer’s perspective or ‘point of view’. 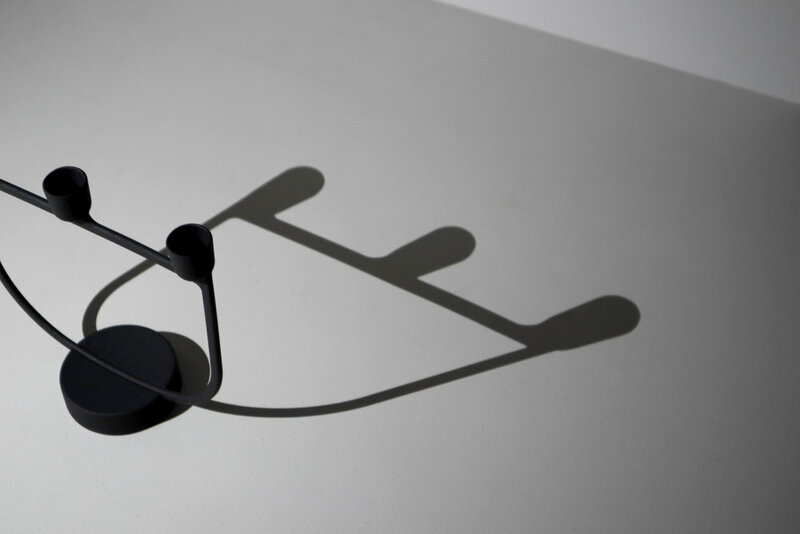 As the viewer begins to perceive the objects it becomes apparent that no two perspectives yield the same visual effect. For the juxtaposition of the light filtering foils in combination with the glass surfaces can create moments of deep density or contrasting transparency and all the variations there within. An occultation occurs when an apparently larger body passes in front of an apparently smaller one. 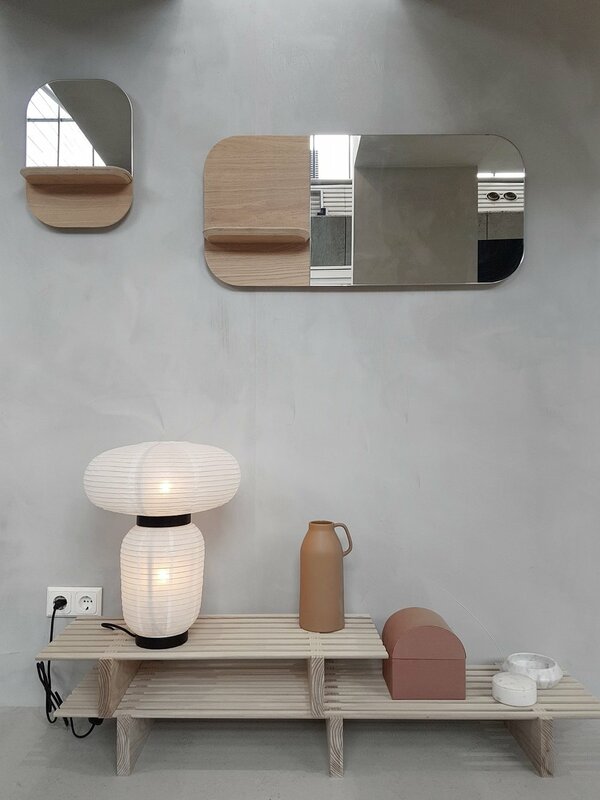 Beautiful collection from AND LIGHT was also presented for the first time in the Netherlands, part of this collection is designed by Lukas Peet (brother of Oskar) who lives in Vancouver Ca. 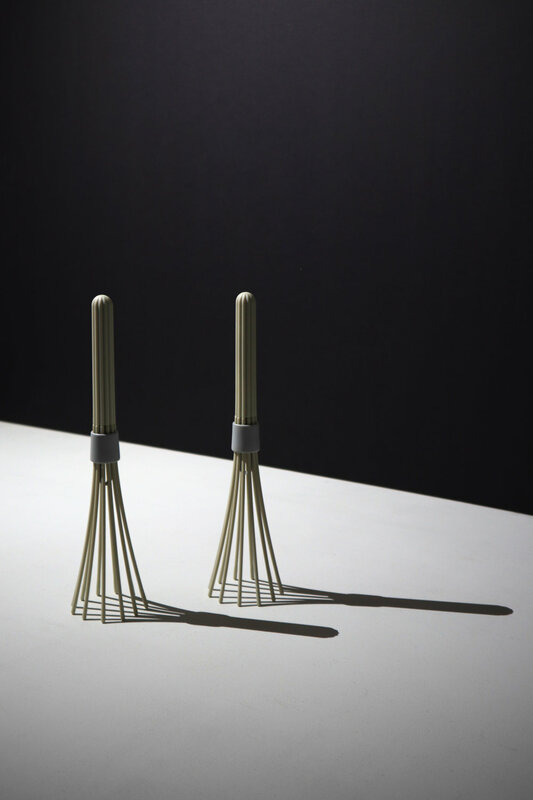 overall, one of our favourite things we saw this year at DDW. Comments? as always, let us know! Ever since we got our Montana TV & Sound, we had been wanting to take a few pictures from it but of course our own space always comes to the end of the to-do list. Our Tv room is where we gather as a family, even when we leave the tv off, it is where we get together and enjoy being together ;) and of course where the kids jump on and around everyday. Music is essential for us, so our living space is mostly surrounded by instruments, which make for beautiful objects! 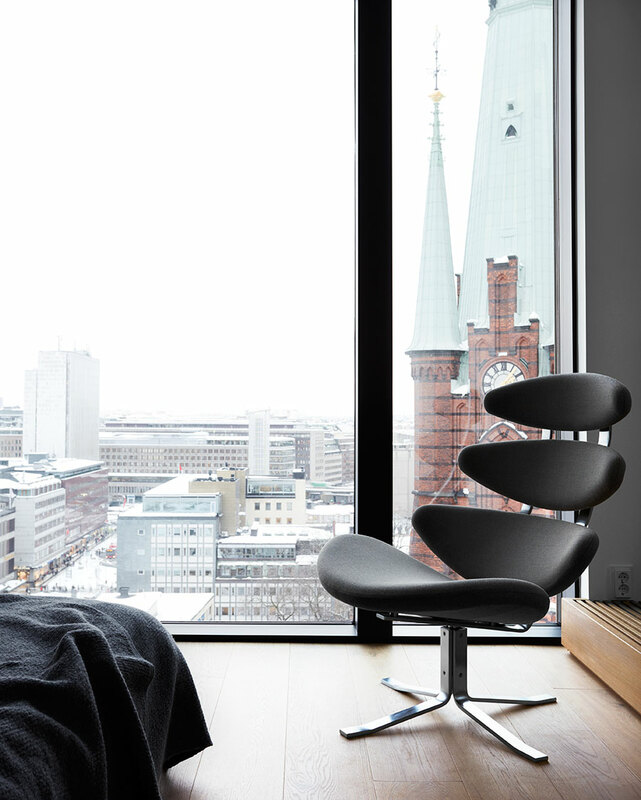 Greyscale & colours of nature, make things serene and easy to live with in a day to day basis. 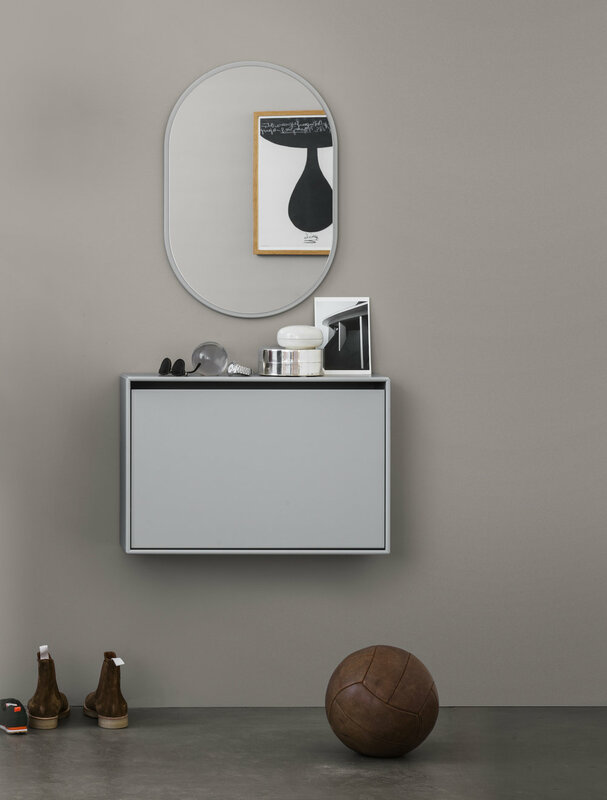 The folded shelf from Muuto, gives elegance and a possibility to use the wall for storage, without invading the space. 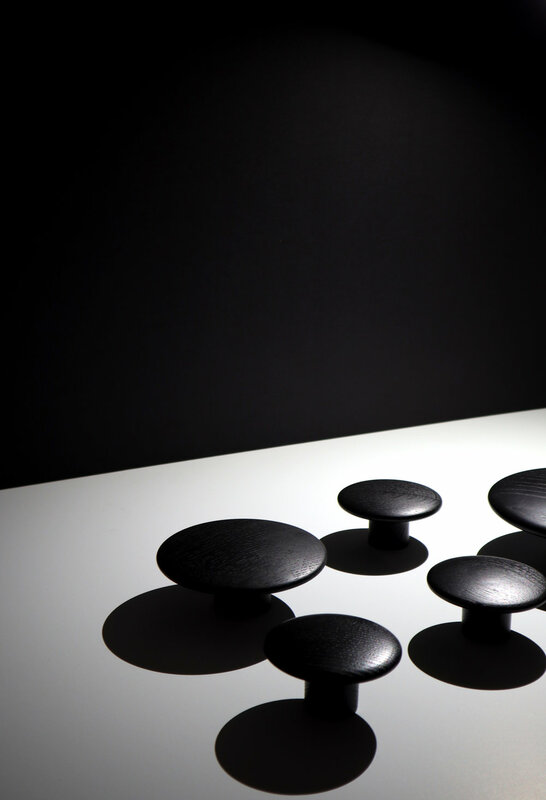 And the beautiful Stone lamp from Menu makes a dark statement of seriousness /coolness that we love. We love our tv room, and hopefully you love it too. Any comments? we love to hear them. This season, Montana introduced their new Collection IV, which is a series of ready-made pieces that you can easily choose for specific solutions. This collection comes very handy for those who love Montana but are overwhelmed by the huge array of possibilities the Brand has to offer. The whole philosophy of Montana since it began in 1982, is to create possibilities, and this new way of presenting these, as they call them “ready-made solutions” , give a specific function to each one of them, so you only have to pick your solution and choose your favourite among 42 different colours. All of these awesome images were created by Montana. We have divided them into the separate areas of the home. Everything you can order via crioll.design and if there are any questions, don’t hesitate to contact us. RAIL - is ideal for wall-mounting in the hallway or the entrance of a bedroom or closet. HIDE - The shoe storage cabinet with a tilting door and interior plastic mat protecting from dirt and scratches. UNLOCK - a small wall mounted cabinet for keys and small items fitting perfectly in a small hallway. 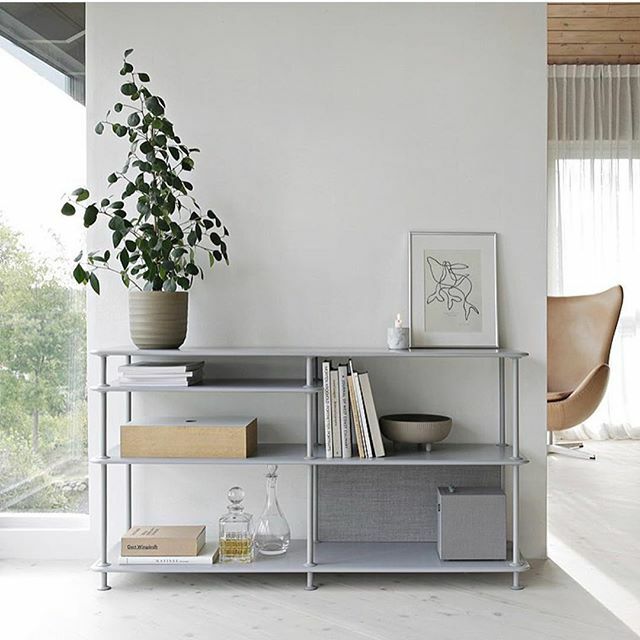 REST - a combined bench and shelving unit, perfect in the hallway for either seating or keeping your favourite items. Both a bench and a storage solution, Rest is the perfect example of a multifunctional furniture. READ - the classic bookshelf composed by displaced shelves in varying sizes perfect for books and bits and bobs. 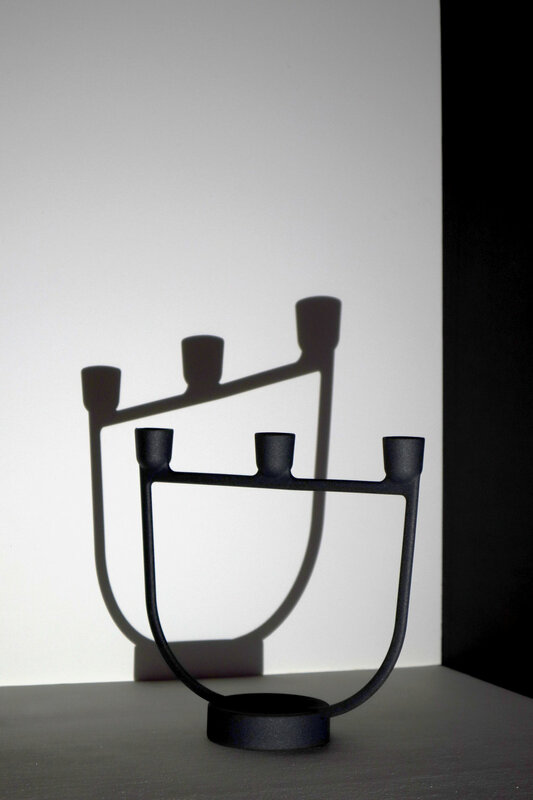 BEND - an open-shelf with a playful - almost sculptural - expression. 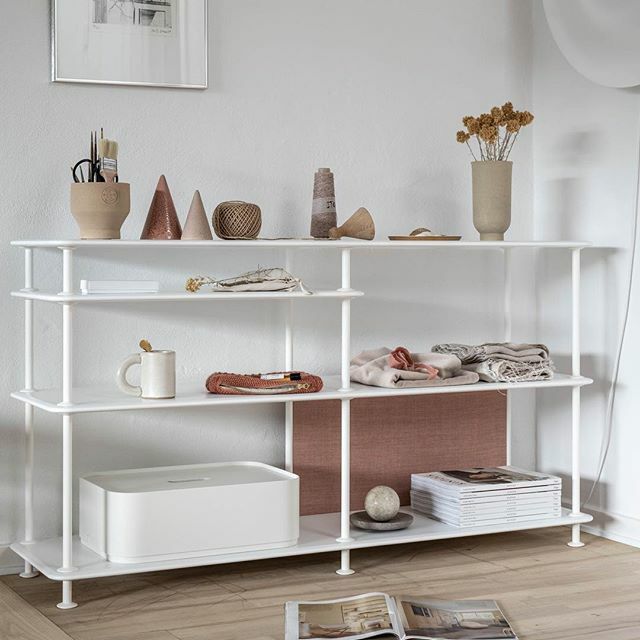 SHOW - a small bookcase for the living room, storage solution for the hallway or as display solution for the kitchen. CELEBRATE - ideal as bar cabinet where beverages and equipment for making drinks can be stored during day time and transform the living room for party time at special occasions. 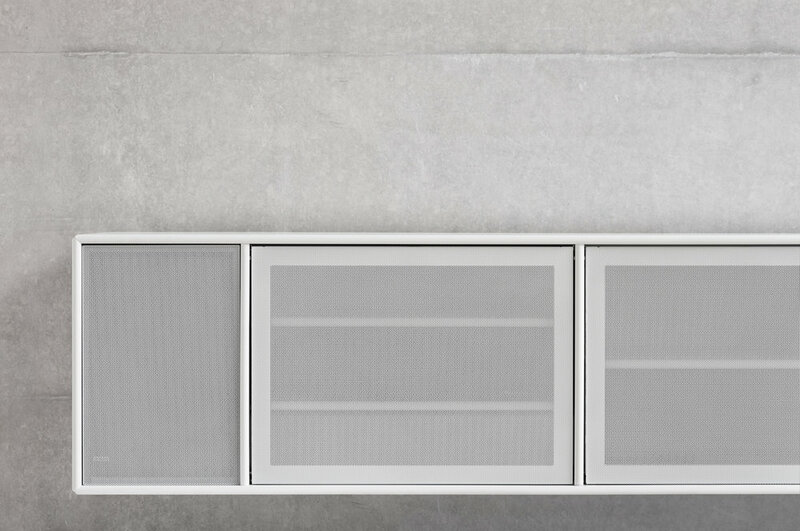 RISE - display cabinet an ideal storage solution for the dining room or kitchen, great to store what is to be displayed and what needs to be stored away. PAIR a cabinet and chest of drawers in one. DREAM - ideal as a bedside table in the bedroom for books, a glass of water, glasses or the alarm clock. The nightstand is also usable as a flexible side table in the living room or hall. KEEP - a chest of drawers ideal to keep everything in order in the bedroom, living room or in the hall. If you eventually desire a new look just move away the top module and use it separately. The ideal dresser for the living room, bedroom or home office where to store and keep things in order until you need them again. Organize teddy bears, dolls, cars and blocks in the colourful PLAY storage box on castors. Montana’s unique colour palette consists of 42 lacquer colours. 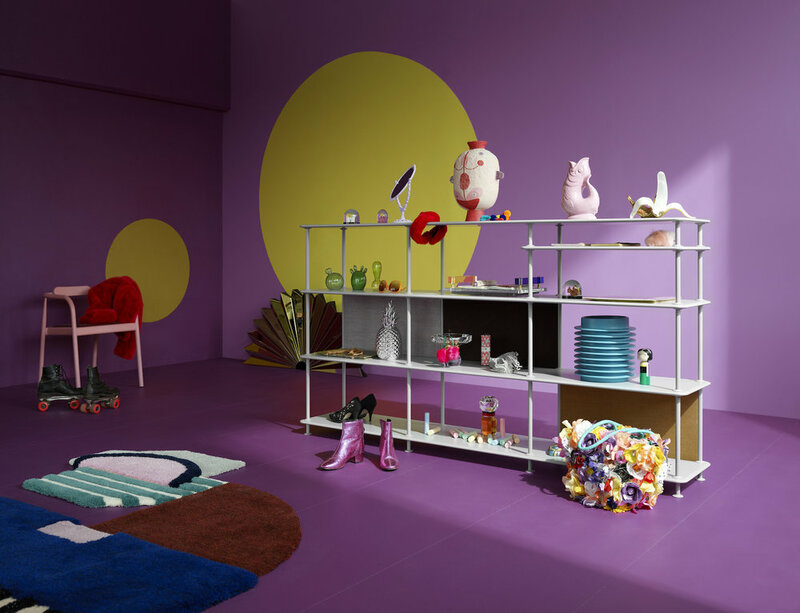 In collaboration with the colour expert Pernille Kaagaard they have created 7 colour families with environmentally friendly, water-based lacquer colours. Autumn is clearly here and it is difficult to deny with all the leaves now everywhere. So we had to play around with the leaves in our garden, which piled up pretty fast even though the trees have still a lot more leaves to shed…. 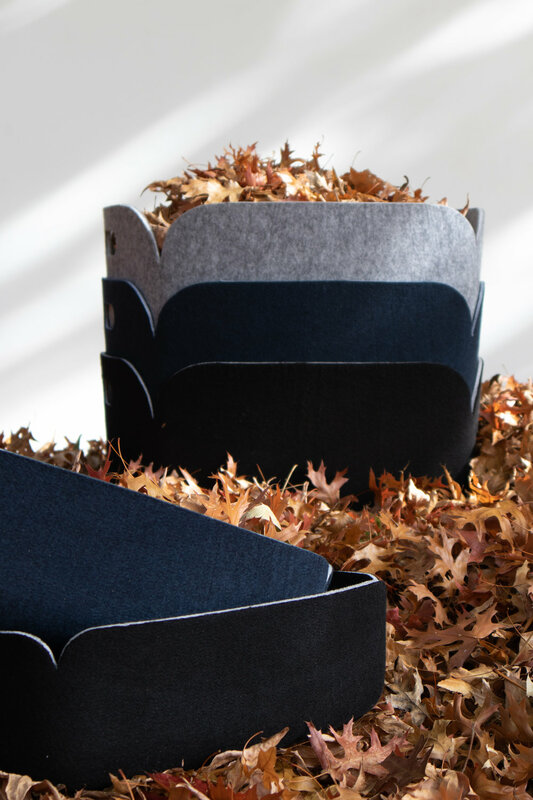 This time it was the Restore basket from Muuto we shot for our weeks deal. Thanks for reading, comments are welcome as always! 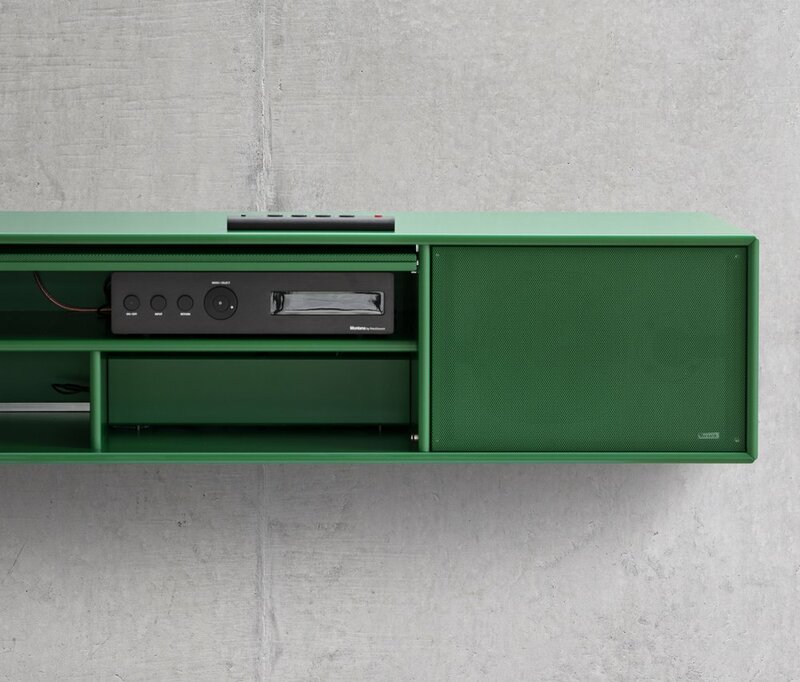 The TV & Sound modules have been designed for storing Hi-Fi systems and electronic equipment. 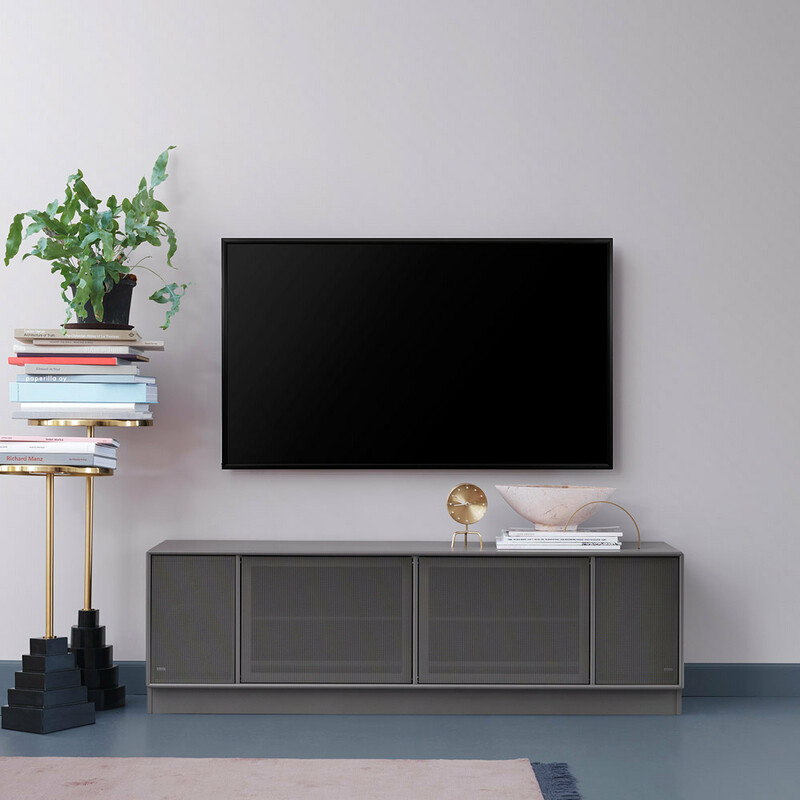 Enjoy your high resolution TV and crisp surround sound without the clutter of cables, remote controls and other electronic devices and accessories. 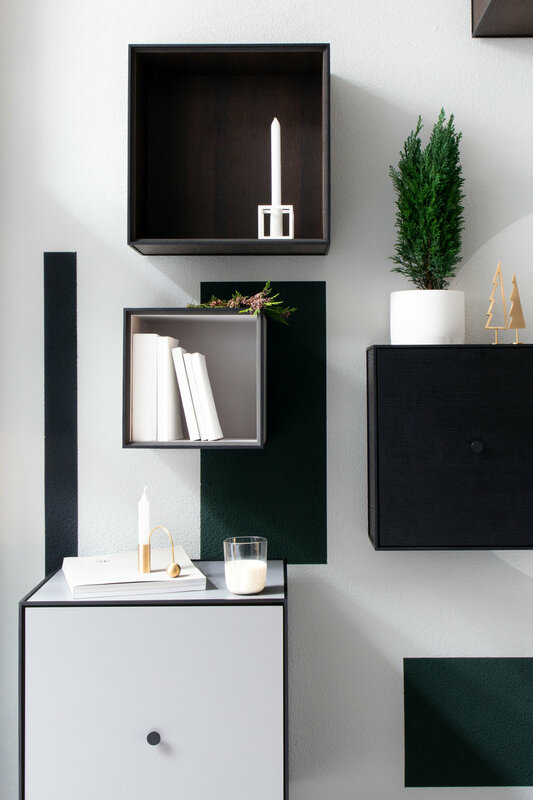 Store it all away in a classic and beautiful storage solution, designed to suit your needs. Choose between the Montana 42 colour-palette. This shelving unit is available with legs, castors, suspension rails or plinth. The retractable doors discreetly hide the electronic equipment. The door has a perforated steel front lacquered in Montana’s colours. The door has no handles; to open, push lightly at the bottom and slide it up under the top of the unit. The perforated retractable door makes it possible to operate electronic equipment through the closed door, and provides better air circulation around the devices. 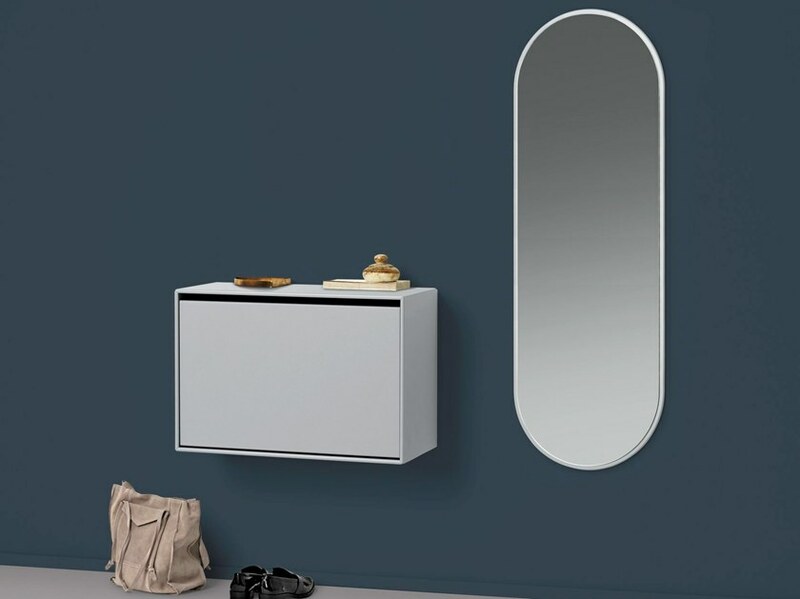 Choose between a multitude of different models and sizes with doors, drawers, perforated retractable doors, suspended on the wall, with castors, on a plinth or on legs. Play with a palette of 42 colours. Let it blend in or stand out. Endless opportunities to create, frame and tell your personal stories through clever design and superior craftsmanship. Contact us for price information and to make an appointment to see it up-close. We love BAUX. 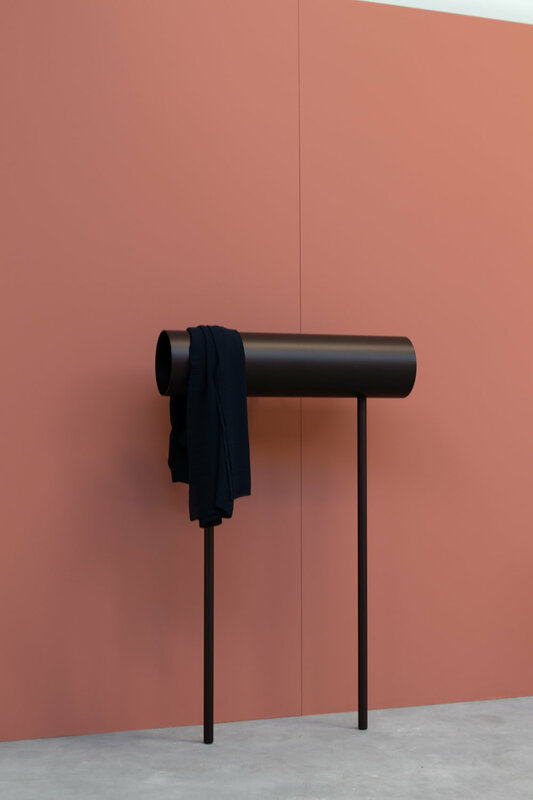 It’s modular, comes in many colours, shapes and sizes, and its a not-so-expensive solution for acoustics if you are actually concerned with aesthetics. We first found out about BAUX by following Form Us With Love, a Swedish design studio that we absolutely admire. Ive gathered some images from their image bank, along with their own text, but I can tell you as an already active user of BAUX, they are as good (or even better) as what you see from their own communication. 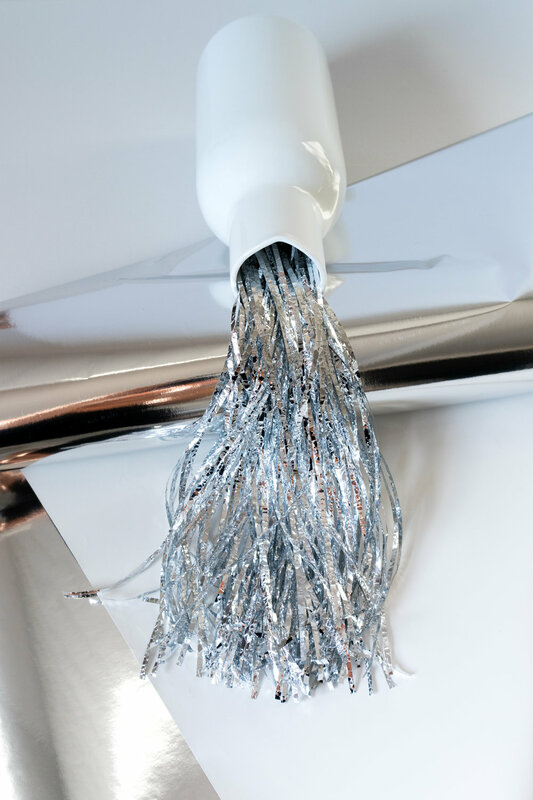 They are super easy to install (meaning you just have to glue them to the wall) and since they are modular and there are so many possibilities, the end result really depends on your own (or the architect’s) creativity. You can see a project we did with BAUX here. Give us your comments or contact us if you want to know more. BAUX Acoustic Panels is an environment-friendly, recyclable material made from wood wool, cement and water. The natural components together provide many functional characteristics. BAUX Acoustic Panels is available in 7 patterns; Quilted, Check, Stripes, Lines, Diagonal, Arch and Curve. All designed to be combined into infinity. They come in 2 sizes: H = 29 cm and H 59 cm. And these the basic colours, which if you are ordering more than 35M2 you can get your own custom colour. As you can see, you can go as big and as creative as you want! 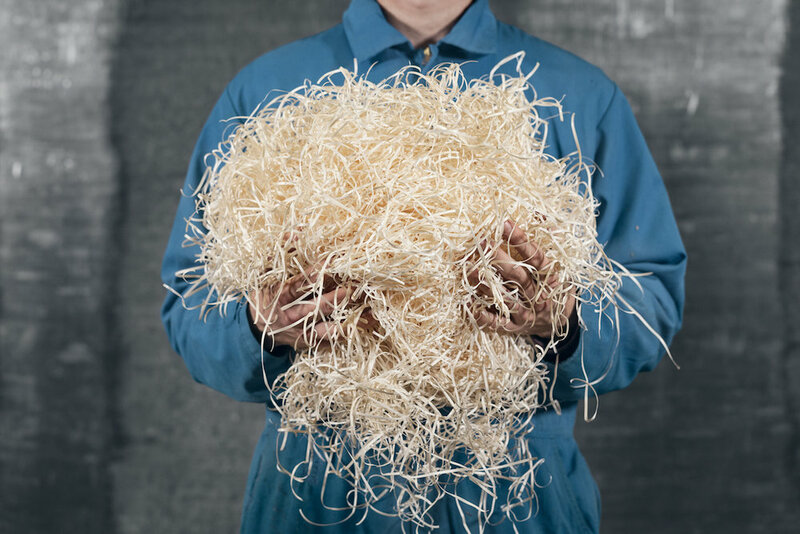 An environment-friendly, recyclable material made from wood wool, cement and water. This is the natural version, which is later spray-painted. 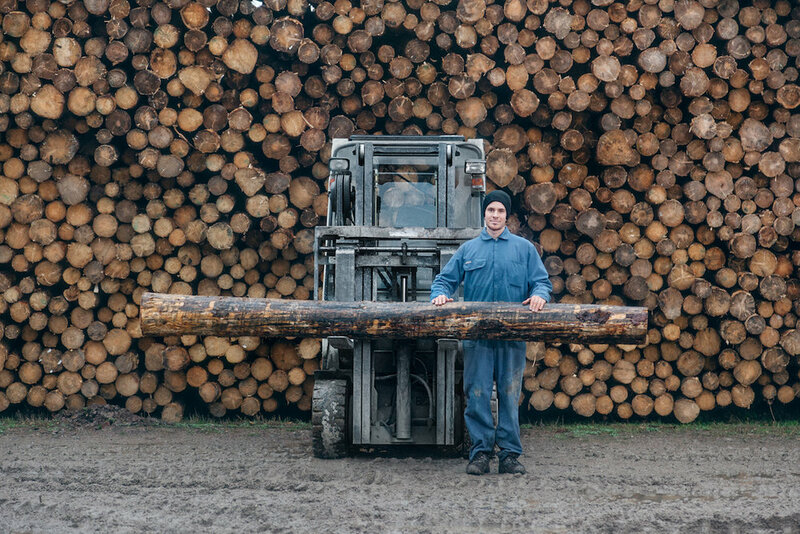 BAUX is a joint a venture between entrepreneurs Johan Ronnestam and Fredrik Franzon and the founding partners of design studio Form Us With Love; Jonas Pettersson, John Löfgren and Petrus Palmér. 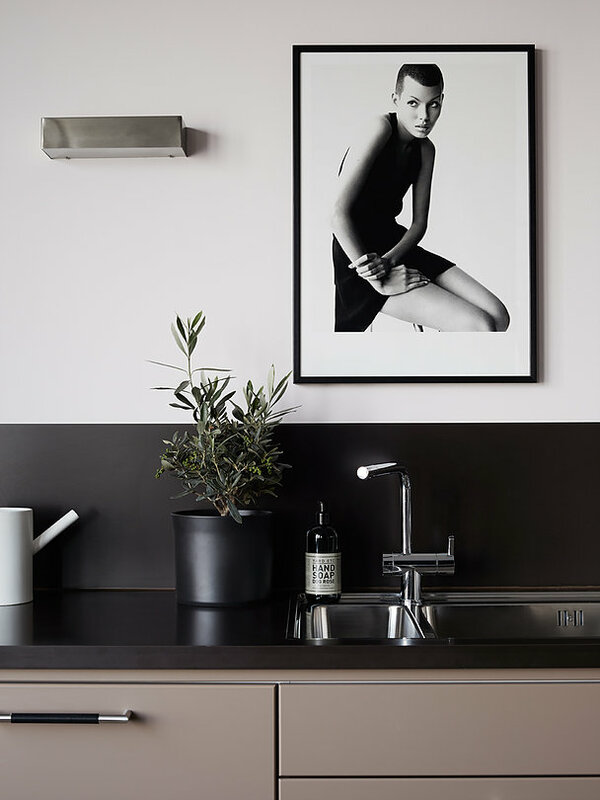 Recently, we found these incredible pictures via pinterest and totally fell in love with this apartment. 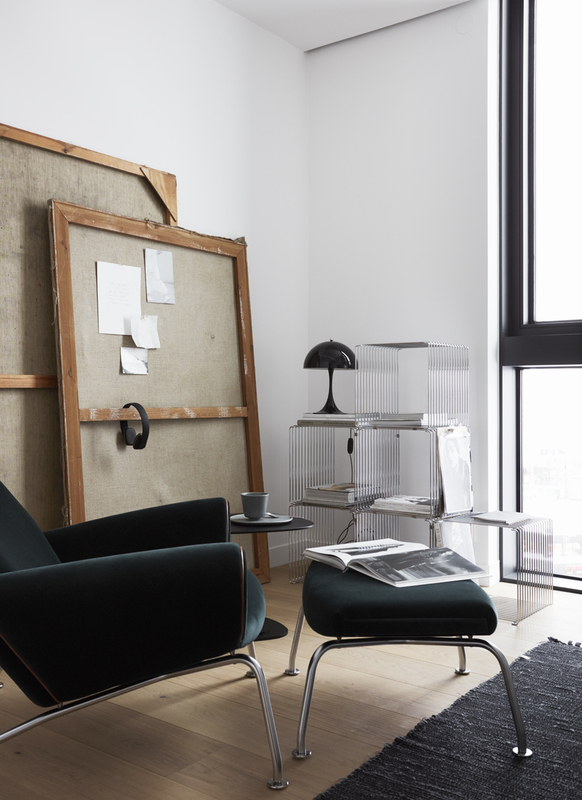 The styling and concept by Pella Hedeby is gorgeous and the apartment is breathtaking; from the materials used to the colour schemes and OMG the huge windows giving the perfect light, and what can I say about the view of snowy Stockholm. I mean, who wouldn’t love living here? 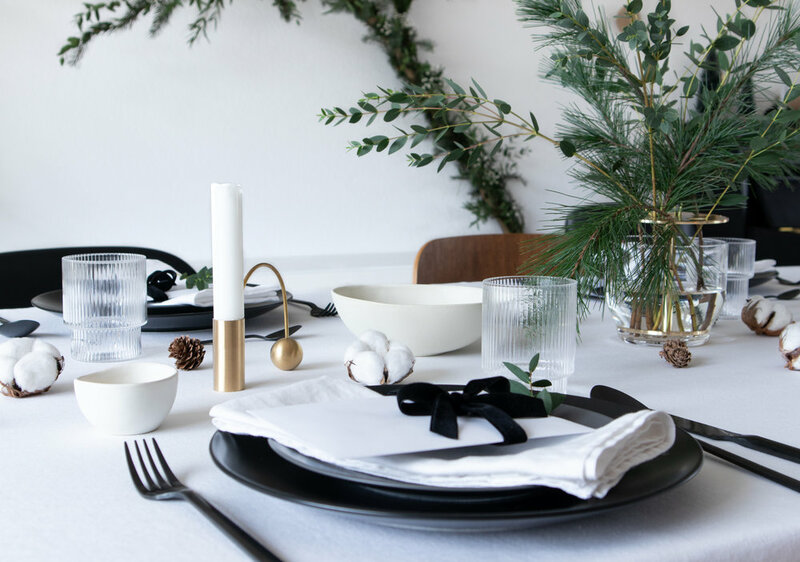 A selection of luxurious Danish classics: collaboration between interior stylist Pella Hedeby and ELLE Decoration . 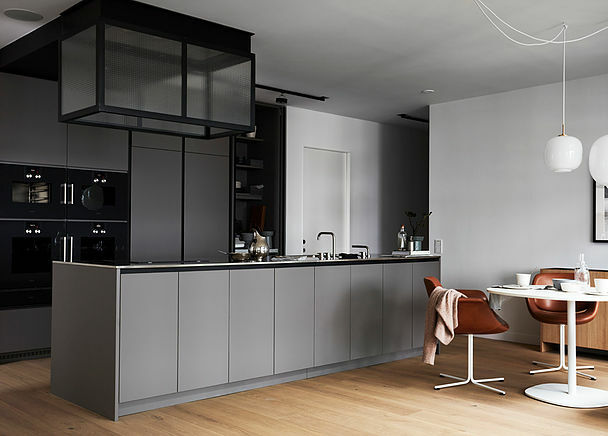 The apartment was designed by Andreas Martin-Löf, who also designed the kitchen. 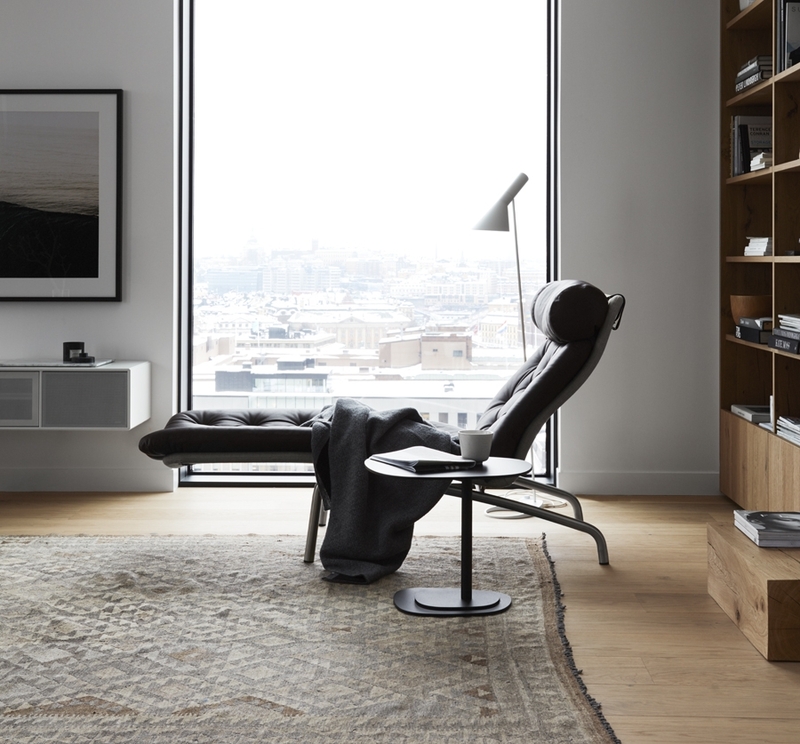 “My idea of the interior was to create a home that would be truly luxurious, while feeling relaxed and homely”. 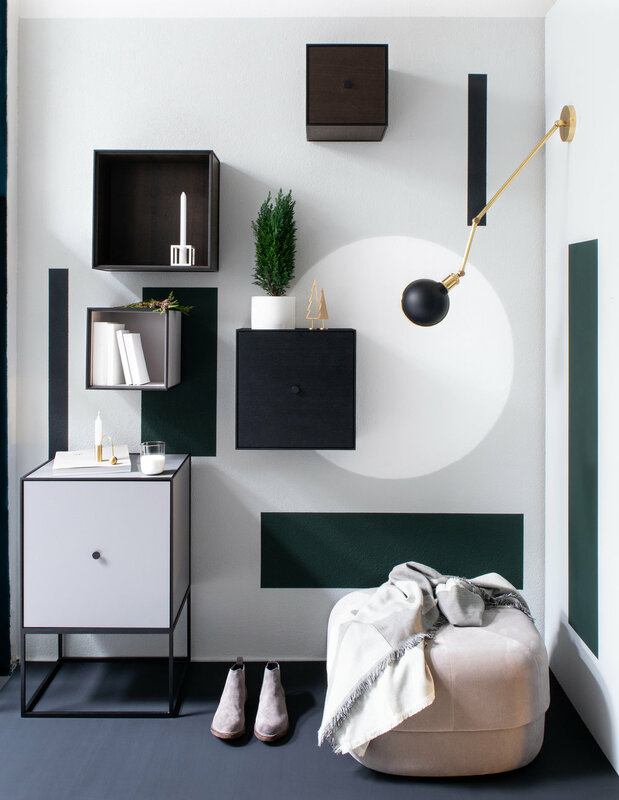 The following images and text were taken from the designers’s own article made for ELLE Decoration. Give us your comments or contact us for more information about any of the products here displayed.